For the last year, my colleagues and I at Institute for the Future have been researching the future of science to identify big areas of science we think will have a transformative impact over the next decade. We read a lot of papers, conducted interviews, hosted an Open Science unconference, held an expert workshop with researchers from UC Berkeley, Stanford, MIT, UC Davis, SETI, and private industry, and spent many weeks synthesizing what we learned. 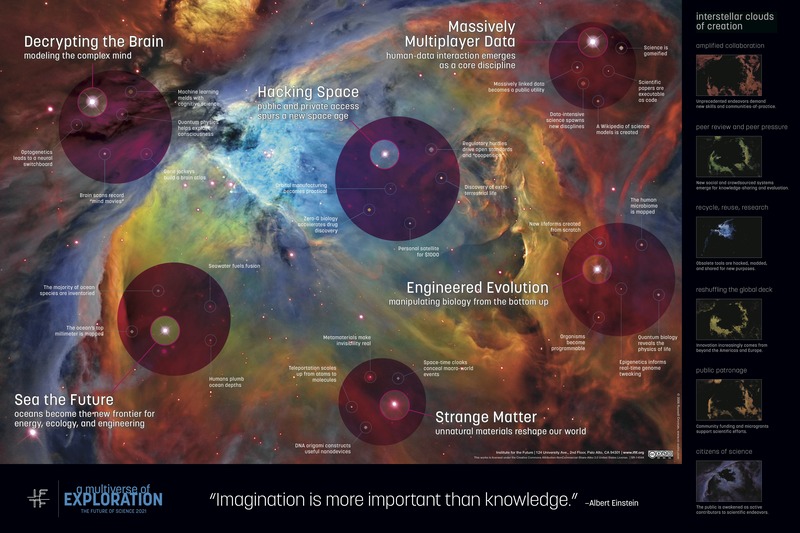 The result is this map, titled "A Multiverse of Exploration: The Future of Science 2021." You can click the image to see it larger or download the PDF (front and back) here. Marina Gorbis, Ariel Waldman, and I wrote it. Ariel, Jean Hagan, and Karin Lubeck made it beautiful. illuminating our place in the universe. translate into new technologies as well as new organizational structures. dynamic, turbulent, and startling multiverse of exploration.